A lot of people welcomed the lightweight build of the Adidas Adizero Sub 2. The flexible nature of the underfoot platform was much appreciated by consumers. Many testers were happy that the width option followed their needs. The durability of the outsole unit was lauded; some runners claimed that it didn’t show signs of wear, even after many miles. There were no not spots felt while wearing the Adizero Sub 2, according to a couple of testers. Some testers complained that the underfoot cushioning wasn’t as efficient as they expected. For them, it didn’t bring the responsiveness that’s anticipated of running shoes. The Adidas Adizero Sub 2 was able to capture the attention of elite athletes who want to take on races and other high-tier running sessions. Most of them liked the insubstantial weight of this neutral shoe while others lauded the upper unit’s smooth nature. And though some people weren’t happy with the midsole unit, it didn’t become a universal gripe. Adidas recently introduced their newest marathon racing flat, the Adizero Sub2, after their popular Adizero Adios Boost line was overtaken in the marathon game by the Nike Vaporfly 4%. The Sub2 is impressively light, breathable, responsive and fast. As Adidas has made a staple of, in their partnership with Goodyear, the shoe also has incredible traction. The weight Adidas cut when comparing the Adios line to the Sub2 made the shoe firmer and more responsive, with a very “close to the ground feel.” However, the lack of cushioning in the forefoot makes the shoe a great 5k to half marathon option but only will be a marathon shoe for a select audience. The upper of the Sub 2 is very light and breathable. In fact, you can see right through most of the shoe (notice this in the pictures). The upper lacing system provides a secure feeling even with the obvious reduced material used in forming the upper. The upper is also very flexible in the toe box, something that the Adidas Adios line did not provide. Adidas has implemented a fully lined Boost midsole in the Sub2. The Boost material was previously only partially used in the heel of the Adios midsole. The improvement is more responsiveness in your run, which the Boost material has become known for. However, the Boost material used in the forefoot does seem to make the forefoot area quite a bit firmer. The Sub2 produces an audible slapping noise when the foot strikes the ground. I’ve run next to others wearing the Sub2 and noticed it sounds quite different from them as well. The Sub2 outsole is all one piece with a smooth heel to toe transition reminiscent of the New Balance Fresh Foam Zante. The one-piece outsold offers a smooth midfoot and even heel-strike landing zone. The Goodyear traction offers the best traction and connection to the ground feeling of any racing flat or shoe that I have tried. If running in damp or wet conditions the reassurance of this technology is second to none. The Boost material throughout the sole gives the Sub2 a pop that the adios doesn’t quite have. However, the Sub 2 is quite firm in the forefoot and does not offer much cushion. In this respect, it would be tough to recommend this shoe as a marathon shoe for many. Based on your foot-strike and cushioning needs in a marathon it could be a great option, I would think many will need more cushioning. The Sub2 shoe is firm, fast and responsive. I’ll be wearing it in anything shorter than a marathon. However, in the marathon, striking the balance between weight and cushioning, the Sub2 is just a little too light and not quite enough shoe to take me there. 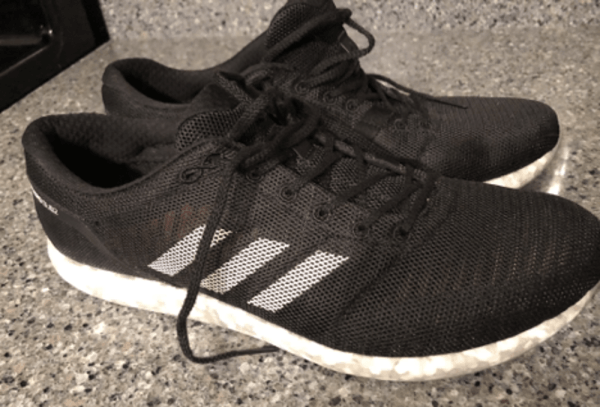 The Adidas Sub 2 has been unleashed in the athletic quest to break the magic two-hour barrier in Marathons, so I had high hopes for this racer. And it didn’t disappoint. It has a light and easy feeling on the foot, with a great, highly supportive fit with no pressure points. Other notable specs include the firmer feel of Boost Light technology as compared to Ultra Boost or the Energy Boost midsoles. The result is an easy fitting, light and breathable shoe that doesn’t squeeze the feet to pain as many race flats do. 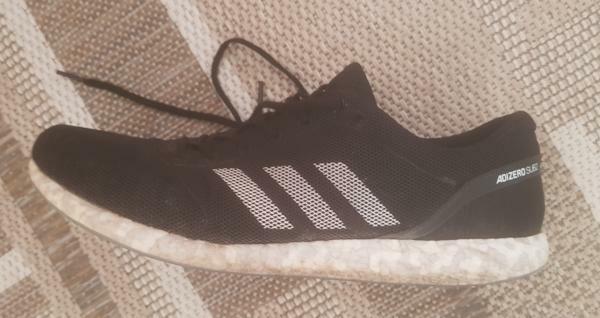 The rubber felt adequate, the heel cup moderately firm and the heel cuff is also lower than the most Adidas shoes. A light and airy dual density mesh cover the entire upper with only one supportive overlay on the medial side of the midfoot. The Microfit upper is made of a single layer of thin small holed soft mesh that makes the shoe very breathable. The mesh is woven slightly denser on the inside to create vertical bands of support. The fit is snug and on the narrower side which is common for faster shoes. With the midsole, they used a different kind of boost. It’s firmer, much lighter and feels like it has less lateral deflection. With this new PEBA-based Boost compound, it feels firmer but with a good vibration dampening. It has a single continuous slab of Continental micro web outsole. The full length and full ground sole provide great durability and traction. The shoe has very good flexibility, as it allows for a more natural transition when running. The Sub 2 has an ample surface area that should accommodate all types of foot strikes. I’m a huge fan of the Adidas Adizero Sub 2 racing shoe. I’m a heavy (88kg) runner and this lightweight shoe is even comfortable for me and not just the lightweight elite runner. The Sub 2 takes the conventional race flat to a new level of refinement, incredibly light, comfort and with state of art materials and elegant thoughtful design. While the shoe may not look super aesthetically pleasing to some, the feel is definitely where it makes up a lot of that ground. The Adidas Adizero Sub 2 is a running shoe that’s designed for those who want to take on long races and extended running sessions. Marathoners and competition enthusiasts are the target audience of this product. It makes use of a lightweight and uncluttered design to adequately accommodate the movement capacity of the foot. A mesh exterior and a set of underlays offer a secure yet breathable coverage. Underfoot cushioning is provided by a full-length compound. Its job is to carry the foot and keep it comfortable throughout the running session. Its thin profile also accommodates the natural bending capacity of the muscles and joints of the foot. The Microweb outsole covers the rest of the sole unit, protecting it from wear and tear. The Adidas Adizero Sub 2 was designed using the standard measurements, so it is recommended to get the usual size to achieve a pleasant in-shoe experience. When it comes to width, the option is D – Medium. It is advertised as a unisex shoe, but the dimensions were geared towards men. The semi-curved shape of the last and the form-fitting upper mimic the natural curvature of the human foot. The outsole unit of the Adidas Adizero Sub 2 makes use of the Continental™ Microweb, which is a full-length rubber layer that covers the entire midsole unit. It shields the cushioning foam from wear and tear. It is also responsible for traction over surfaces that are both dry and wet. Shallow flex grooves allow the platform to bend in conjunction with the joints and muscles of the wearer’s foot. These mild indentations help in bettering the toe-off phase of the gait cycle. A lightweight version of the boost™ cushioning platform is used in the Adidas Adizero Sub 2. This full-length foam is made up of thousands of thermoplastic polyurethane pellets that have been fused together. Its job is to deliver a responsive ride. The Pure Boost is another Adidas running shoe that is known for the signature boost™ midsole material. The Advanced Mesh is a lightweight cover system that offers a breathable wrap. It has breathing holes all over its façade to permit airflow into the foot-chamber. It has internal support layers to bolster its structural integrity and to keep the foot secure. The Microfit lockdown system is composed of thin overlays and stitched reinforcements. These elements work together to maintain a snug coverage. A traditional lacing system is employed in the Adidas Adizero Sub 2. It uses semi-round shoelaces, sewn-in reinforcements on the eyelets, and a fabric anchor on the tongue. These components are responsible for tightening and loosening the fit. Extra apertures are placed near the tip of the collar to lock the heel in place.